Lots of brands are getting into wearable tech. But Puma decided to make some "raceable" tech in the form of a little robot pin wheels that follows the lines on racing tracks and pushes runners to hit any pace, and eclipse it. J. Walter Thompson worked with Puma on the "BeatBot," which is explained in the video below, featuring a cameo by Usain Bolt. The programmable, self-driving, line-following robot was developed with help from a group of MIT engineering graduates. It uses nine infrared sensors to follows the line on a track. The robot's wheel revolutions tell it exactly how fast and far it's traveling. It processes that data in real time, making over 100 maneuvers a second to stay on course and cross the finish line at exactly the right time. It is equipped with bright LED lights so you can see it in your peripheral vision, and it has front and rear GoPro cameras so you can review video footage after the race. "We created the first 'raceable' tech tool, BeatBot, which helps professional runners improve their performance in real-time," said Adam Petrick, Puma's global director for marketing and brand management. 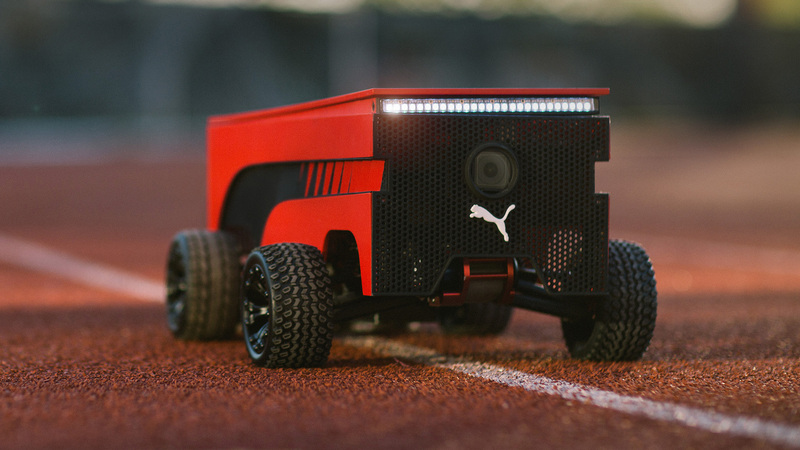 "BeatBot is a concentrated technology whose application demonstrates Puma's mission of being 'Forever Faster.' "
The downside? It's a big one. This thing is so expensive to build that Puma is only making it available to professional runners and teams, which is why none of the marketing materials point to a site where a normal person could actually buy the thing.